I just returned home from grocery shopping a little while ago. I used to despise grocery shopping, but that's because I always felt so lost in a sea of endless food choices. But recently, I have come to enjoy my trips to the grocery store more and more for the simple fact that I have followed the rule of grocery shopping for healthy eating, which is to spend most of your time hanging out in the perimeter of the store where all the whole foods are rather than the inside aisles where all the processed food resides. I usually go to the grocery store with my husband every Saturday morning and when we get there, he will go and take back the returnable bottles (Michigan has a ten cent deposit on bottles and cans) and I'll start shopping. Every week he comes back from returning the bottles and declares, "How did I know I'd still find you in the produce section?" Today, he repeated this routine and after hearing it week after week, over and over again, I snapped. I got snippy with him and said, "Why is that funny to you? This is where I SHOULD be spending most of my time. It means we're eating well and staying healthy." I guess I got so defensive because eating healthy is not something worth making fun of, and it felt like he was poking fun at me. We should be giving a hard time to the people who don't bother to try to make real food, choosing instead to fill their carts with processed crap pumped full of chemicals. We should not be making fun of the people who are choosing to feed real, wholesome food to their families. That is honorable, not worthy of torment. Roughly 50% of Americans are overweight or obese precisely because they don't spend enough time in the produce department, and you're going to make fun of me for spending most of my time there dear husband? I don't think so. Oh, men. They always tend to joke about the things we find important. We try to shop around the edges of the grocery store as well only venturing in to the "danger zone" for certain necessary items like cereal. Next time just tease him back or poke him in the belly. I didn't exactly register that a supermarket was build like that... but now you mention it... it is true! I agree real food is best. I have given up processed, fake food and spend every weekend at the farmer's market. The produce in your photo looks so good you could spend a long time there. I love how it is arranged. And I'm on that soapbox with you and have been for forty years now! 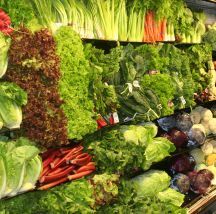 I could spend hours in a supermarket, I love going through the fresh produce, debating what to make. And it's nice that the organic aisle is getting more in to choose from. Yeah, my husband would know just where to find me, too! Preach it, sister! Absolutely. When I explained the shop the perimeter concept to my husband a few years ago, he really liked the idea -- something easy to remember. On the other hand, I've had a lot of years to convert him. I think most people who read your post will be right up there with you on that soapbox. It does seem strange, but the real food is what you have to hunt for in the grocery stores. I always shop the outside circle of whatever grocery store I enter. My husband usually does the shopping and definitely spends most of his time in the produce section, and in the health/organic food section too.